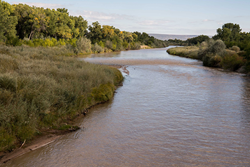 The Rio Grande north of Santa Fe, New Mexico. This funding will help establish cooperative working relationships with Indian tribes and tribal organizations and ensure they can be fully engaged as they develop, manage and protect their water resources. Bureau of Reclamation Commissioner Brenda Burman announced that fourteen tribes were selected to receive $1.9 million for technical assistance through the Native American Affairs Technical Assistance to Tribes Program. "Reclamation is committed to working with tribes on water management issues," Commissioner Burman said. "This funding will help establish cooperative working relationships with Indian tribes and tribal organizations and ensure they can be fully engaged as they develop, manage and protect their water resources." The Native American and International Affairs Office in the Commissioner's Office serves as the central coordination point for the Native American Affairs Program and lead for policy guidance for Native American issues in Reclamation. To learn more, please visit http://www.usbr.gov/native.